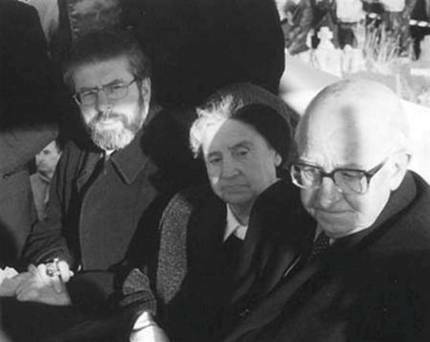 Pat McGeown photographed beside Gerry Adams. 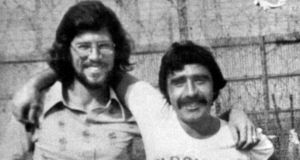 THIS is Sinn Fein President Gerry Adams with two members of the gang that dragged Jean McConville from her screaming children to be brutally beaten, murdered and disappeared. 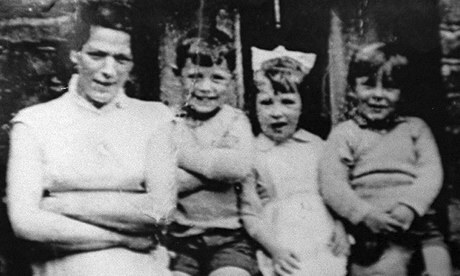 Madge McConville (no relation to Jean) was the head of the women's wing of the IRA in the lower Falls Road area at the time the widowed mother of 10 was murdered. She died in May 2009 and was eulogised by Sinn Fein as representing "what republicanism was about and ... the embodiment of our history". The photograph was taken in January 2000 at a ceremony to mark the re-burial of Belfast IRA man Tom Williams, who was hanged in 1942 for the murder of RUC constable Patrick Murphy. Williams had been buried in the grounds of Crumlin Road Prison in Belfast after his execution. He was disinterred and re-buried in west Belfast, with Adams and Madge McConville as lead mourners. In the other photo, Adams is alongside Pat McGeown who was also part of the gang that abducted Mrs McConville. McGeown, who died in October 1996, was a 17-year-old member of the junior wing of the IRA at the time. He subsequently became a Sinn Fein councillor in Belfast. 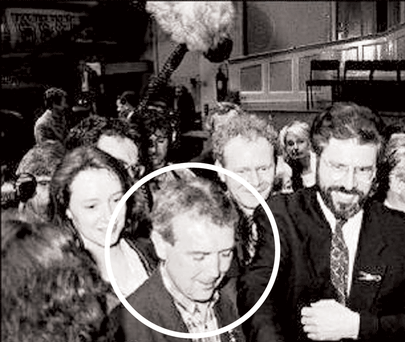 McGeown and Adams are together with a group of Sinn Fein leaders after the count in the May 1996 elections to the Northern Ireland Peace Forum. 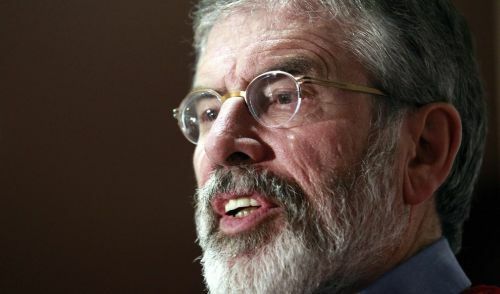 Adams and McGeown were close associates and shared the same prison hut in the Long Kesh internment camp outside Belfast in the early Seventies. Republican sources in west Belfast say it was the 17-year-old McGeown who shot Mrs McConville through the back of the head as she knelt in front of her burial site on Sheeling Beach in Co Louth. On his death the Sinn Fein newspaper An Phoblacht reported McGeown "was a political prisoner in the infamous Cage 11 along with such notables as Gerry Adams and Brendan Hughes". 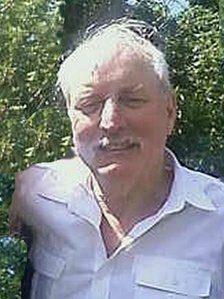 Brendan Hughes was the first IRA man to publicly name Gerry Adams as his "officer commanding", alleging that he was the one who gave the order for Mrs McConville's murder and disappearance. Adams continues to deny this. McGeown was one of the republican hunger strikers in the Maze Prison in 1981 and spent 47 days without food before it was called off. His period of starvation led to ill-health and his early death at the age of 44 from a heart attack. After his death, Sinn Fein launched a community endeavour award in his name and Adams described him as "a modest man with a quiet, but total dedication to equality and raising the standard of life for all the people of the city''. Madge McConville was given the job of stopping young women fraternising with the British soldiers who were initially welcomed by Catholics after they stopped the invasions by loyalists mobs in the area. The soldiers held discos in a factory they had commandeered as a barracks. Young Catholic women who were identified as attending the discos were abducted and beaten up. Several were also tied to lamp posts, their heads shaven, and covered in black paint and feathers in the same way French women deemed collaborators with the Nazis were tarred and feathered after the Allied invasion. A decision was made not to kill any of the young Catholic women, many of whom were driven out of the area, because of their local family connections. 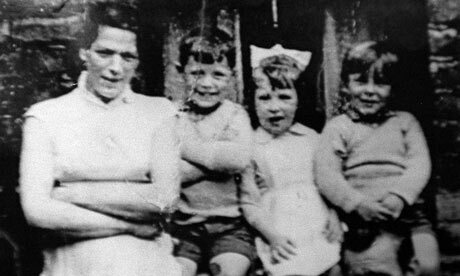 But according to local sources, Mrs McConville was sentenced to death because she was a Protestant who had married a Catholic, Arthur, who had died in 1971 leaving her alone to bring up their 10 children. She had no family connections in the Falls area. Mrs McConville was allegedly targeted because she gave a cup of water to a soldier who had been injured outside her maisonette in the Divis complex in the lower Falls. A gang of up to 20 male and female IRA members abducted and murdered her. The intention of the IRA leadership was to ensure that there was no relationship between the local community and the soldiers or police. The tarring and featherings and finally the murder of Mrs McConville ensured this.